Draw or create a map of your local area. Include places you like visiting and things you like doing. You could also include the places you’d like to go more often. Is there a new area, activity or group you’d like to explore? You could highlight everything from parks, libraries, cafes to football clubs, community groups and meet ups. Get creative celebrating your home and all it has to offer. This could also be a great opportunity to see what’s missing. Could you possibly get involved with filling a gap? Find your local Fun Palace happening this weekend and see if you could go. If you can’t make it, how could you engage online or find a way to be part of the conversation? If you’re feeling really energised, there is always time to do your own! It doesn’t have to be super shiny, just have a go and see who turns up. There are lots of resources and tools on the Fun Palaces’ website to help. How often do you interact with your community in a fun way? Would you like to do more? How could getting creative together help you and your area? Share your map with us! We’d really love to see what is going on in your community. 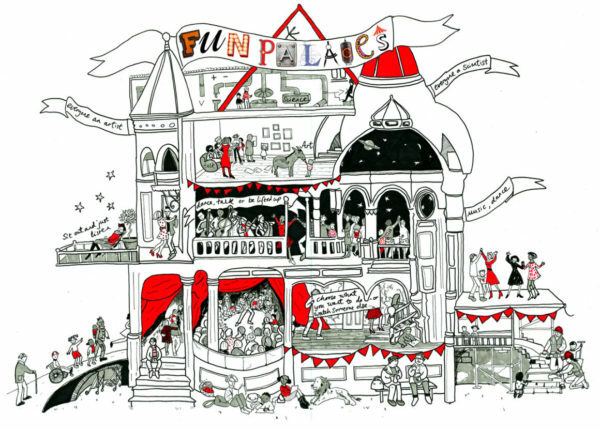 If you’re planning to go to a Fun Palace share your experience too @funpalaces with #FunPalaces. Don’t forget to tag #64MillionArtists and share your challenge on Twitter, Facebook and Instagram.